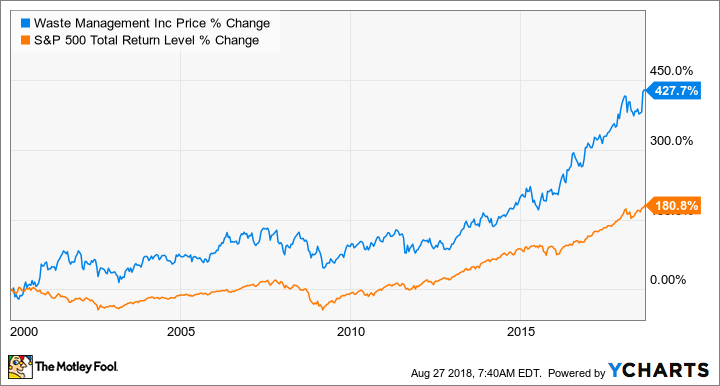 Thor Industries, Waste Management, and Activision Blizzard could elevate your portfolio's performance over the next two decades. One of Warren Buffett's most famous investing adages is, "If you're not prepared to own a stock for 10 years, don't even think about owning it for 10 minutes." That doesn't mean that investors should never sell a stock; business conditions can be expected to change in ways that throw even prescient investors for a loop. But there are significant advantages and undeniable results that back up the wisdom of aiming to find great businesses worth owning for the long term. For this roundtable, we asked three Motley Fool contributors to profile a company that has the makings of a long-term winner. Read on to see why they think that Thor Industries (NYSE:THO), Waste Management (NYSE:WM), and Activision Blizzard (NASDAQ:ATVI) are stocks that are poised to do big things over the next 20 years. Rich Smith (Thor Industries): Color me embarrassed. When I was asked nine months ago to name a stock I thought would be good to hold for the next 20 years, I picked RV maker Thor Industries, which at the time was trading close to an all-time high north of $150 a share. With Thor stock trading for a recent share price of $94 and change, do I think now's the time to abandon this stock pick? Perish the thought! Listen, folks: Mr. Market may have lost faith in Thor, but I have not. Last quarter, Thor reported sales growth of 12% and earnings growth of 20%. The company's firmly profitable and free-cash-flow positive. Thor carries no net debt, and it pays a respectable dividend of 1.6%. Plus, Thor Industries stock is cheap. Priced at just 10.8 times trailing earnings, Thor's a bargain for the 17% long-term growth rate that Wall Street assigns it. And with much of the baby boomer generation still set to retire, I think the next two decades should see Thor enjoy all the growth it's pegged for, and more. Tyler Crowe: (Waste Management): Waste and refuse are pretty much an aspect of our everyday lives, and handling that waste can be an incredibly attractive business that is hard to disrupt. Most people don't want a landfill in view of their house, and the environmental regulations associated with handling and disposing of waste mean its incredibly hard to put a landfill just anywhere. That's what makes Waste Management, the nation's largest refuse handler, such a compelling investment. Restrictions around landfill locations, the capital required to prepare a site, and the amount of spending needed to build out a fleet of collection vehicles make it incredibly hard for new entrants into this business. The industry richly rewards companies that have scale, and Waste Management has used that competitive advantage to generate incredible returns for investors. Even though margins aren't high and revenue growth is modest, management uses the loads of free cash flow it generates for large stock buyback plans to manufacture faster earnings-per-share growth. Couple that with an increasing dividend, and you get a business that generates loads of shareholder value over the long haul. Trying to change behaviors -- like reducing the amount of refuse we generate -- is hard, which means that Waste Management is likely to have a business that can flourish for years to come. Shares of the company rarely trade for a deep discount, but it's reasonably valued at 18 times earnings today. For someone looking to invest in a stock for multiple decades, Waste Management looks like a good buy. Keith Noonan (Activision Blizzard): Video games have come a long way since Pong made its way into American homes in 1972. The quality of visuals has grown by leaps and bounds. Online multiplayer games have become commonplace, connecting people around the globe. And roughly a third of the world's population now has a portable gaming device in the form of a smartphone. Even with these big changes, there's still a lot of untapped potential in the medium from both the creative and business perspectives. And Activision Blizzard stands out as a top stock for those looking to benefit from the ongoing growth of interactive entertainment. The video game industry is notoriously difficult to succeed in, and the last couple of decades have seen many former winners fold amid rising production costs and changing consumer tastes. But Activision Blizzard looks like it can keep itself in the forefront in the space. The company boasts one of the strongest franchise portfolios in the industry, has some of the top development talent, and has a great track record of coming up with new experiences and properties that delight consumers. As the global audience for games continues to expand, Activision Blizzard should continue to benefit from the growth of digital distribution and the sale of in-game content -- two revenue streams that yield significantly better margins than selling through third-party retail channels. The company has other big opportunities as well. The esports phenomenon, or competitive video games as a spectator sport, is still in its infancy and has the potential to become a substantial revenue source. Activision is also making a big push in the consumer products space, and has started its own film and television production studio to bring hit franchises like Call of Duty and Overwatch onto the big and small screens. With a leadership position in the video game industry and opportunities to branch out to other promising growth markets, Activision Blizzard looks primed to be a winner over the next two decades.